Ritchie Blackmore (Deep Purple, Rainbow, Blackmore's Night) is THE guitar reference for all the Europeans and of course Japanese. He's is in the market since over four decades and wrote some big big hard rock anthems. 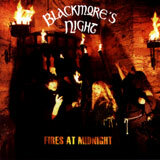 But these times are gone and Ritchie Blackmore's Night's style goes from classical, Irish folk to old rock. The band is made of the combination of Richie Blackmore and Candice Night which not only share the same stage but also the same bed in life. There is nothing much more to say about Mr. Blackmore, but a lot about Candice's voice: crystal clear and very similar to Maggie Reilly (Mike Oldfield). The style of Blackmore's Night is pretty close to the period of 1983 and 1984 where Mike Oldfield had a huge success with Discovery and Crises (by the time with Simon Philipps as drummer).